It turns out that there could be issues when you’re changing files on your local system and using them from a VirtualBox VM. This can/will you if you’re working with small, static files under Vagrant when using VirtualBox as a provider. To fix this, add “sendfile off;” to the location-blocks (if using Nginx) that are responsible for your static files. If you’re developing software on a Mac that’s targeted for use in a Linux environment, you’re not alone. You might be lucky-enough to be working in a scripting language-based project, so the difference between environments isn’t nearly as brutal as it would be if you actually had to perform builds. Still, there is the occasional environmental difference. One such difference is what baked-in Nginx modules you’ll get on an Ubuntu host versus your Mavericks host. What if you need the same push/Comet module on your Mac that you get when you install the nginx-extras package? This is the nginx-push-stream-module module (there’s at least one other module with a similar name, which is usually an additional source of confusion). You might think that you need to download the source to that module, potentially have to deal with build-dependencies, clone the standard nginx Homebrew formula, modify it, and build. You’d be wrong. This requires the nginx-full formula because, besides push-stream-nginx-module, it has a massive number of definitions for third-party modules, whereas the normal nginx formula has very few. Your configuration will be largely preserved from the old Nginx to the new (only the launch configs should change). As a result, you can use a similar command to install each of these modules. The guy who’s responsible for this is easily worth his weight in donations. There are few applications created in today’s world that achieve scalability and/or profitability without thoughtful reporting. The key is to be able to push a massive number of tiny, discrete events, and to both aggregate them and view them in near real-time. This allows you to identify bottlenecks and trends. This is where the statsd project (by etsy) and the Graphite project (originally by Orbitz) comes in. A statsd client allows you to push and forget as many events as you’d like to the statsd server (using UDP, which is connectionless, but aggressive). The statsd server pushes them to Carbon (the storage backend for Graphite). Carbon stores to a bunch of Whisper-format files. When you wish to actually watch, inspect, or export the graphs, you’ll use the Graphite frontend/dashboard. The frontend will establish a TCP connection to the backend in order to read the data. The Graphite frontend is where the analytical magic happens. You can have a bunch of concurrent charts automatically refreshing. Graphite is simply a pluggable backend (and, in fact, the default backend) of statsd. You can use another, if you’d like. The purpose of this post is to not necessary spread happiness or usage examples about statsd/Graphite. There’s enough of that. However, as painful as the suite is to set-up in production, it’s equally difficult just to freaking get it running just for development. The good news is that there is an enormous following and community for the components, and that they are popular and well-used. The bad news is that issues and pull-requests for Graphite seems to be completely ignored by the maintainers. Worse, there are almost no complete or accurate examples of how to install statsd, Carbon, and Graphite. It can be very discouraging for people that just want to see how it works. I’m here to help. These instructions work for both Ubuntu 13.10 and 14.04, and OS X Mavericks using Homebrew. If you’re using Homebrew, install the “cairo” package. It’s super important to mention that graphite only works with Twisted 11.1.0 . Though the requirements will install this, any other existing version of Twisted will remain installed, and may preempt the version that we actually require. Either clean-out any other versions beforehand, or use a virtualenv. Answer “yes” when asked if you should create a superuser, and provide credentials. Make sure “WHISPER_FALLOCATE_CREATE” is set to “False” in conf/carbon.conf . No handlers could be found for logger "cache"
Since the development server binds on all interfaces, you can access it from a non-local system as well. If you’re using Brew, install the “node” package. Update “graphiteHost” in config.js, and set it to “localhost”. If you want to get some verbosity from statsd (to debug the flow, if needed), add “debug” or “dumpMessages” with a boolean value of “true” to config.js. This script will post a random number of events in clustered bursts, waiting for one second in between. Graphite is a dashboard that allows you to monitor many different charts simultaneously. Any of your events will immediately become available from the dashboard, though you’ll have to refresh it to reflect new ones. When you first open the dashboard, there will be a tree on the left that represent all of the available events/metrics. These not only include the events that you sent, but statistics from Carbon and statsd, as well. Click the “Graph Options” button (on the graph), click “Y-Axis” -> “Maximum”, and then set it to “100”. Click on the third button from the left at the top of the graph to view a tighter time period. Enter ten-minutes. By default, you’ll have to manually press the button to update (the left-most one, at the top of the graph). There’s an “Auto-Refresh” button that can be clicked to activate an auto-refresh, as well. If at some point you find that you’ve introduced data that you’d like to remove, stop statsd, stop Graphite, stop Carbon, identify the right Whisper file under /opt/graphite/storage/whisper and delete it, then start Carbon, start Graphite, and start statsd. 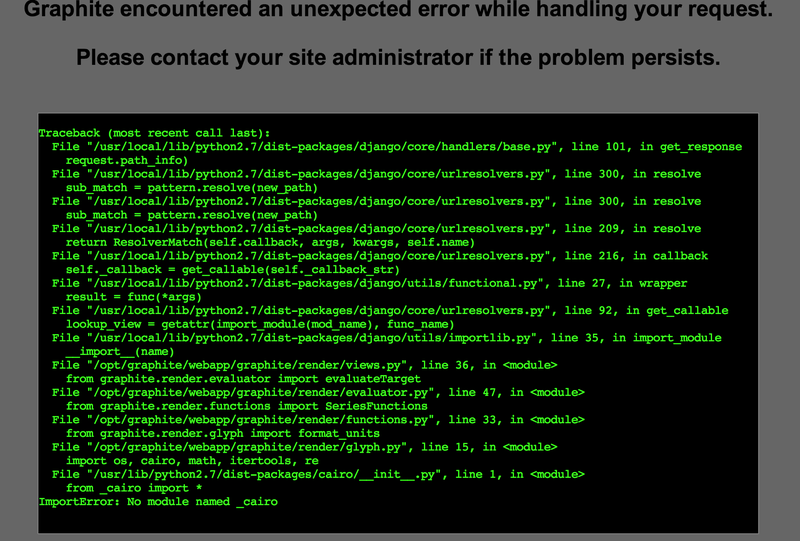 As if the difficulty of getting everything else working isn’t enough, Django is broken by default. It actually seems to depend on the gunicorn_django boot script, which is now obsolete. Getting Graphite working hinges on the WSGI interface being available for Gunicorn. You need to copy /opt/graphite/conf/graphite.wsgi.example to /opt/graphite/webapp/graphite, but you’ll need to name it so that it’s importable by Gunicorn (no periods exception for the extension). I call mine wsgi.py. You’ll also have to refactor how it establishes the application object. Technically, this probably means that just about anything could’ve gone wrong. However, If you forget to do the syncdb above or don’t replace those statements in the WSGI file, you’ll get this error. I’ll be happy if I can save you the time by mentioning it, here. If you get Graphite running but aren’t receiving events, make sure that statsd is receiving the events from your client(s) by enabling its “dumpMessages” option in its config. If it is receiving the events, then check the /opt/graphite/storage/whisper directory. If there’s nothing in it (or it’s not further populating), then you have a file-permissions problem, somewhere (everything essentially needs to be running as the same user, and they all need access to that directory). Long-polling is the strategy of checking for updates or messages from a server by allowing a client to connect but block until data is available. Once data is available, the client processes the data and reads again, potentially blocking again. This is considerably more efficient, in all of the ways that blocking is when compared with polling regularly in the absence of data. Server process that manages messaging. A connection-management framework to maintain a dictionary of mailboxes to a list of their corresponding waiting connections. Providing for the necessary accounting if you want to queue the incoming messages, so reoccurring clients won’t miss any, and then providing the ability for clients to determine what messages have already been seen. All of the required thread-safety for managing connections and message exchange. Enter the all-powerful, all-seeing, all-caching Nginx web-server. It has a couple of modules that reduce the factors above down to a couple of API calls to Nginx: HttpStreamPushModule and HttpPushModule. Though HttpStreamPushModule is, reportedly, the latest of the two modules, only HttpPushModule is available with Ubuntu (as of 13.04). So, that’s the one that we’ll work with, here. To install the HttpPushModule module, install nginx-extras (again, as of 13.04). set $push_channel_id $arg_id;      # The channel ID is expected as "id". # Any number of clients can listen. In our simple example, we’ll play the parts of both the publisher and subscriber. We’ll wait on messages from the subscriber endpoint, while allowing the user to publish messages into the publisher endpoint. We’ll see the first message that Nginx has knowledge of, for the given channel. We’ll see the same message repeatedly. What’s happening here is that Nginx relies on the client to keep track of what messages it has already seen, so, unless given parameters, Nginx will always start at the beginning. // We use these to tell Nginx which messages we've seen.